The International Forage & Turfgrass Breeding Conference (IFTBC) will be held at the Holiday Inn Orlando – Disney Springs. The property is conveniently located within the Walt Disney World Resort and is just a short walk from everything the Disney Springs area has to offer, as well as several Orlando attractions, and shopping. Discounted Group Rate: $140 per night + taxes (currently %) with one or two people per room. The rate being offered to attendees is exclusive and may not be used in conjunction with any advertised or unadvertised promotional specials existing or yet unreleased. This discounted room rate is available three days prior and following the conference (based on hotel availability). This is a discounted group rate and is net, non-commissionable if you are using a travel agent. Click the following link to Book Online. The group code is IFT. Call the hotel at 1-407-828-8888 and ask for reservations. Be sure to identify yourself as a participant of the International Forage & Turfgrass Breeding Conference (IFTBC) to receive the reduced rate. 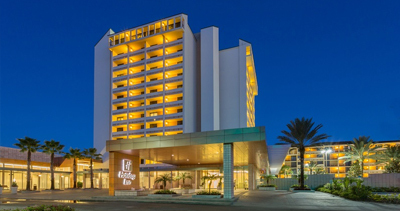 Because March is peak season in Florida, the hotel reservation deadline is February 14, 2019. Please be sure to make your hotel reservation before this date to assure a room in the host hotel at this greatly discounted room rate. Guests are required to present a major credit card whose brand is accepted by the hotel at check-in. It is possible you may be contacted by a company claiming to be the official housing bureau for this conference. These companies contact conference exhibitors and attendees, telling them the guest room block is sold out at the host hotel. The company then quotes a rate at another hotel, claiming it is an official room block and that you must reserve through them to get discounted rates. They ask for your credit card information so they can make a reservation for you. DO NOT FALL FOR THIS or you will lose your money. This scam is affecting conferences all over the country. No matter what meeting you attend, always use the hotel reservation links provided on the host organization’s website. Special Thanks to Our Diamond Sponsor! The University of Florida’s Institute of Food and Agricultural Sciences (UF/IFAS) is a federal-state-county partnership dedicated to developing knowledge in agriculture, human and natural resources, and the life sciences, and enhancing and sustaining the quality of human life. Follow us on Facebook or Join our Mailing List to stay up to date with the latest updates and information regarding the conference.